Aldo Spizzichino was born in Tiglieto (Genova) in 1941, and graduated in Physics in Bologna, where he lived throughout his life. In addition to his career as an astrophysicist, he worked unceasingly as an artist, exploring the field of graphic expression through a variety of visual media, from photography to lithography, producing numerous images over the years for projects ranging from the creation of logos and posters for the scientific comunity and for it’s own sake to make art. His endeavors in artistic research began with the advent of personal computer, the Apple IIe, in particular. At that time, before the development of commercial printers, it was not possible to display and print at the same time, making it necessary to send each print job to a robotic arm working throughout the night; it was not possible to know in advance exactly how the computer- generated image would be rendered on paper. Effects we now take for granted, for example, translucence or diffusivity, were a real challenge back in these early days, and Aldo was one of the people who pioneered, programming by hand, many of the techniques used nowadays in modern computer graphic software, for example, texturing and ray casting. Aldo continued this process of developing his own creative tools for more then 40 years. He found that the joy in the path of ‘reinventing the wheel’ by developing these algorithms himself in his own programming environment, greatly outweighed the difficulties involved in the process. Moreover, he found the process of developing new programming tools to ve very instructive, as it led him understand better the underlying mathematics, and what we perceive as beauty. This personal path permitted him remarkable freedom of creation: he built an extensive toolset of programs in Fortran 77, each employing different algorithms/methods that he would use and mix to produce his final image. One could say that Aldo was able to ‘paint’ with his tools, for example, by constructing images using vector graphics, it was possible to assemble the final image by superimposing several layers made out of thousands of lines and small polygons; in the end, the viewer ‘sees’ the final image in the same manner by which the human brain processes abstract shapes into recognizable forms when viewing an impressionist painting. 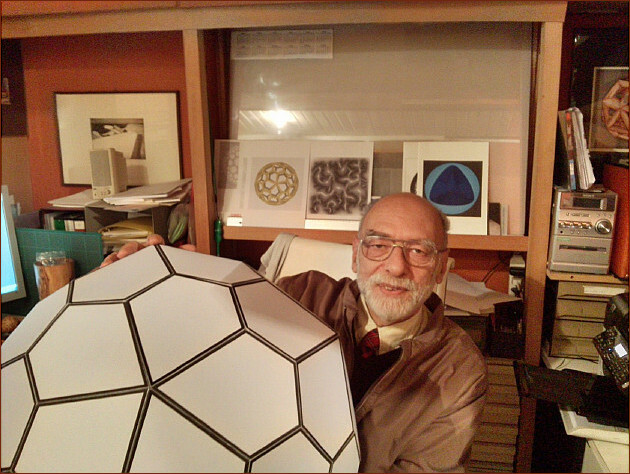 During the years he has been exploring fractals, diffusion limited aggregation, display of Pythagorean and Archimedean and various exotic solid and surfaces, numerous varieties of tessellations, hyperbolic transformations, cellular automata etc., etc. More often than not, Aldo’s images were composed through combining or blending these various elements together, giving birth to new and unique results still not possible with today’s commercially available CG software. Aldo Spizzichino died in June 2017, while preparing the exhibition for 5th edition of the Heidelberg Laureate Forum in the fullness of his creativity.